REDDING, Calif. - Redding Mayor Francie Sullivan will meet with Simpson University students on campus Thursday as part of Constitution Day. The event is open to the community. Sullivan will meet with students from 9:30 to 11 a.m. in LaBaume-Rudat Hall, room 202. There will be coffee and refreshments along with a question-and-answer session. Each year, Simpson University’s History Department sponsors an event in honor of the anniversary of the signing of the Constitution in 1787. Educational institutions that receive federal funding are required to recognize the Constitution during the week of Sept. 17 each year. "Constitution Week is an ideal time to reflect on and reexamine our country's founding documents,” said Cherry McCabe, chair of the History Department at Simpson. “Having Mayor Sullivan join us will reinforce the importance of politics at the local level." 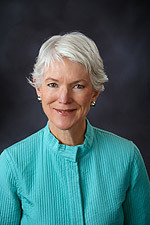 Sullivan was elected to the Redding City Council in 2010 and appointed mayor in December 2014. She previously served as a Shasta County supervisor, president of the Redding Area League of Women Voters, and director of the Shasta County Arts Council. She is a member of the Shasta County Farm Bureau, Fall River-Big Valley Cattlemen’s Association, American Legion Auxiliary, Renaissance Redding board, The Women’s Fund founding cabinet, One Safe Place board, and Friends of the Library.